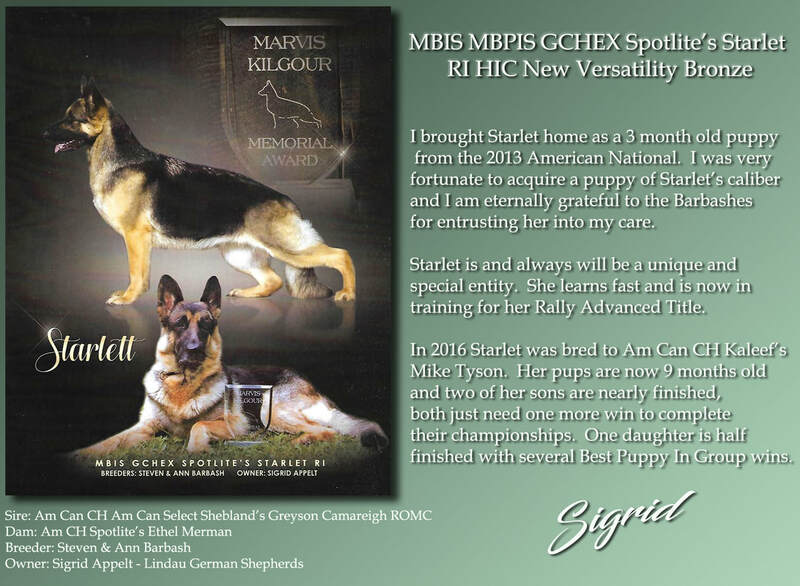 Dogs of Distinction - German Shepherd Dog Club of Manitoba, Inc.
German Shepherd Dog Club of Manitoba, Inc.
the first recipients of the newly created Marvis Kilgour Memorial Award, 2017. Obedience Trial Champion along with his C.D., C.D.X. and U.D. O.T.Ch. Canisphere's Kodiak Grizzly C.D., C.D.X., U.D. score of 199 out of 200 at the GRC MB to finish her CD. 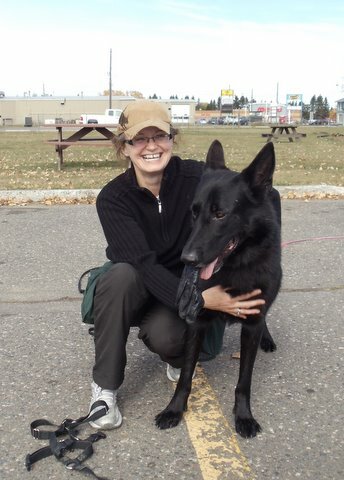 In May 2012 Rita Torpey and her dog Iree completed their FH2. 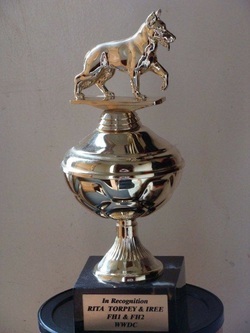 Iree is the first dog in Manitoba to receive this Award and he is only the 12th dog in Canada to achieve this level. SUSANNE OLVER and "MAYA" OTCH INDIRA V.STANGLBERG C.G.N. Rita and Iree at the end of the U.T.D.X. UTD - Urban Tracking Dog and UTDX - Urban Tracking Dog Excellent. They also attained the FH1 - tracking under SV rules - in November 2011. 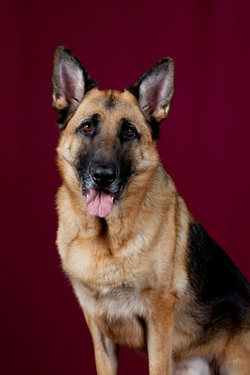 Iree has also been active and successful in CKC obedience trials, earning his Utility Dog title in 2010 and becoming an Obedience Trial Champion. O.T.CH. & CH. Only Cedar Vom Canisphere T.D. Cedar and her owner Debra Robertson have been a successful team with many accomplishments earned. St. John Ambulance Therapy Dog. She has brought Debra many happy years and enjoys her retirement. WITH YOUR BELOVED COMPANION IN WHATEVER EVENT YOU PARTICIPATE IN. BUT IT IS DIFFICULT IF WE DON'T HAVE THE INFORMATION. THIS IS ALL OF OUR WEB PAGE, LET'S ALL KEEP IT INTERESTING. Please check back to see more GSDC Manitoba Super Dogs!